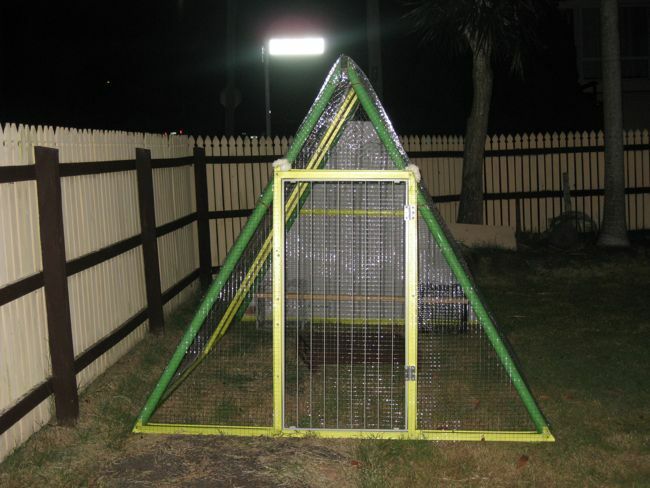 It has been a busy weekend.. we are exhausted.. as state on my last post, we have use the boys old swing set and convert it into a A-Frame chook house / run.. I have a surgery recently which have blown my budget out of the way (it cost about 4 time than I expect to pay 😦 )so buying a new coop or even an additional coop is out of the question. 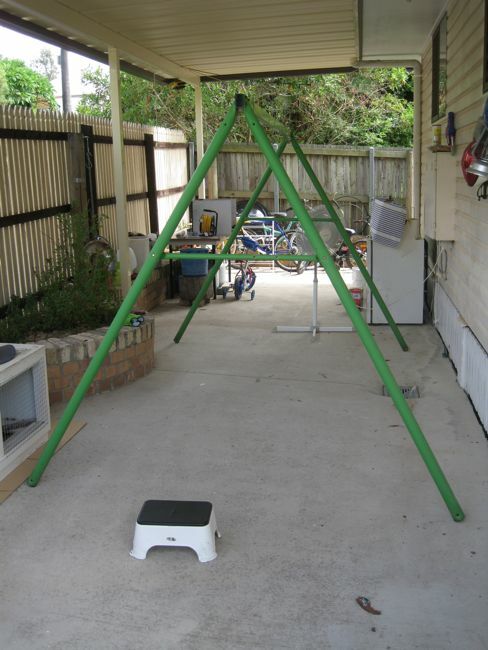 We have a old swing set which is being dump behind the car port.. looking at it the other day giving me the idea of converting it into a A-Frame coop. 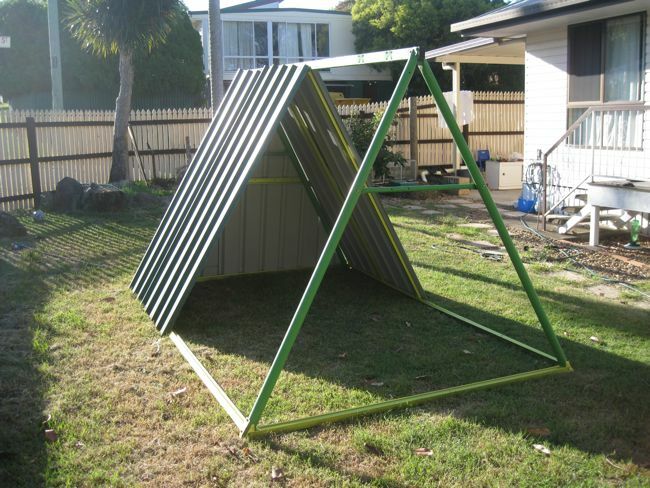 I got the idea from browsing those the housing section on Back Yard Poultry Forum… A lot of chicken coop are in a form of A-frame hatch and there was some very beautiful ‘enlarged’ version of it..
My only concern is.. the swing set is steel.. how do I go about putting my idea together, where shall I find material to made it as economical as possible.. (both me and K are not the DIY type.. we differentiate screw driver between plus and minus sign).. 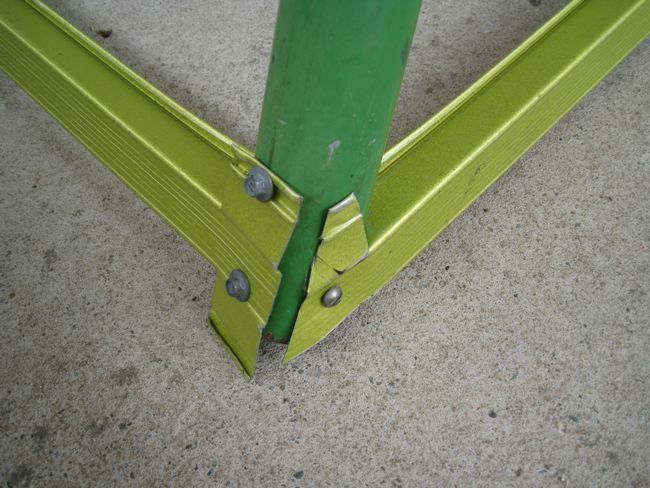 I talk to my BIL who is very handy and he confirm that it is not that hard to ‘attached’ thing onto a steel frame so I decided to give it a go.. I have this grand plan.. 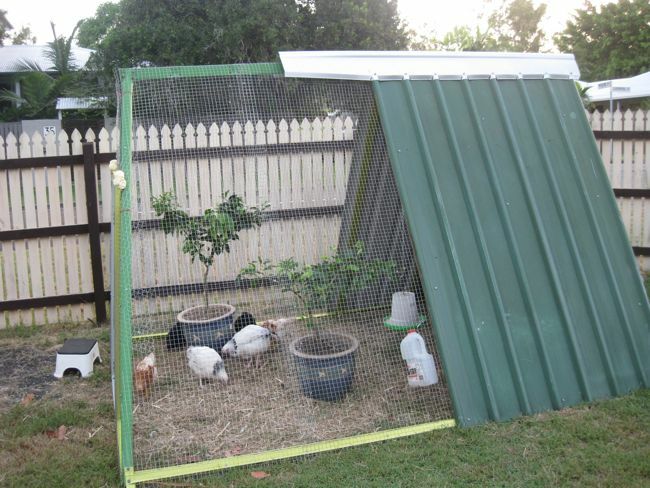 I want an ‘off the floor’ coop inside the A frame as the girls ‘bedroom’ with plenty of space underneath for them to run around.. etc etc.. Walking home from the bus the week before, got me talking to my neighbor across the road, who is also a retired builder.. 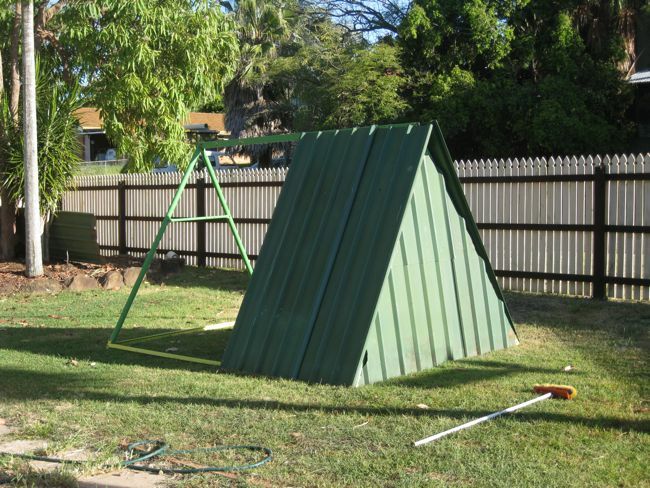 He always have building material laying around his car port so I ask him whether he has any spare iron sheeting that I can buy from him (hopefully cheaply) I explain my plan of converting the swing set into a chicken coop/run.. 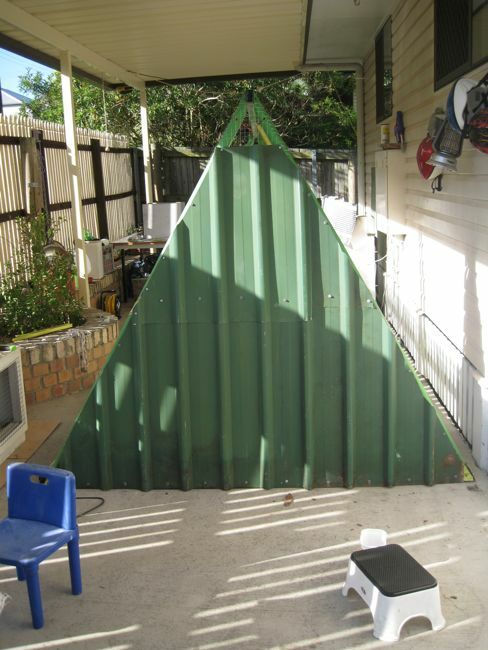 He basically offer me any spare supplies he has ‘as many as I need’ for free.. he said, either I take it or it is going to the dump.. he also happen to have 4 colorbond sheet in the carport as we speak and he said I can have them when ever I am ready.. The iron sheeting is exactly what I needed and told him I will pick it up on the weekend when we are ready to start work. The pressure is on to really get this project going so on Sunday.. we visited Bunning Warehouse to get an idea of costing to find out how much this project will cost me.. and guess who we run into in the ‘trade’ area.. yup.. the friendly neighbor.. I explain to him my plan of the ‘off the floor housing’ and looking for some board that will fit the purpose… After a brief discussion, he told me not to get any as he have some very old board (20 years old) which is still very solid.. it will fit my purpose.. I made plan to meet with him later that afternoon so we can go over my plan (I have about 3 sheets of drawing) and find out what I need and how to go about with it..
After meeting with him.. my ‘plan’ change completely.. 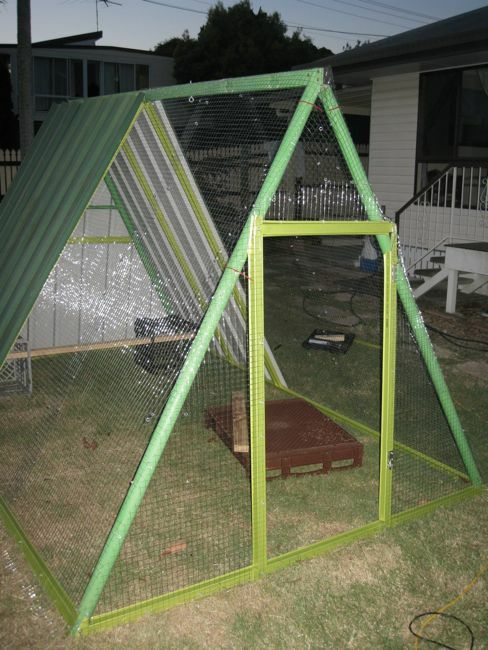 I don’t need an ‘off the ground house’ for the chicken, it will made the work too completed for novice like me and K.. he also made a few recommendation and advice what is the best material to buy to add to the frame.. 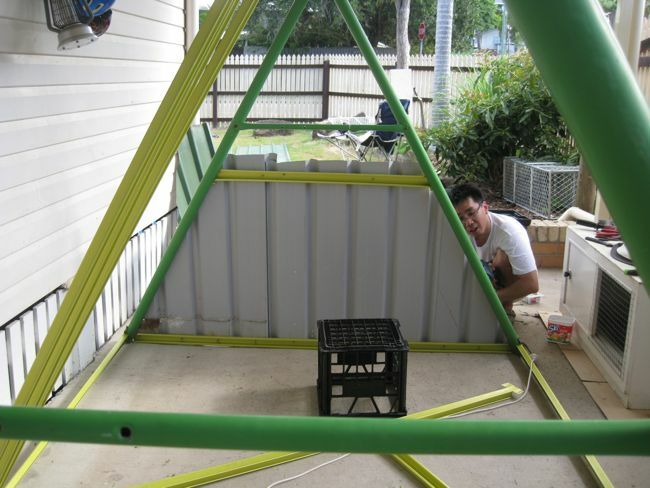 He even offer to buy it for us (as he go to Bunnings everyday) as it is too long for us to take home (6m in length)..
As he will be away for a couple of days to build something on his holiday site, I told him I will give him the measurement by Wednesday so he will know how many ‘frame steel’ to get for us..
K have a RDO on Tuesday, I got a call from him at work, the neighbor have just drop by with 4 of the 6m length steel.. a pack of bolt and a roll of chicken wire.. He also show K how to bolt the sheets onto the frame and how to cut the sheeting to length and lend us the cutter for the job.. We got almost everything to get started and the pressure is on.. Cutting the sheet into size.. 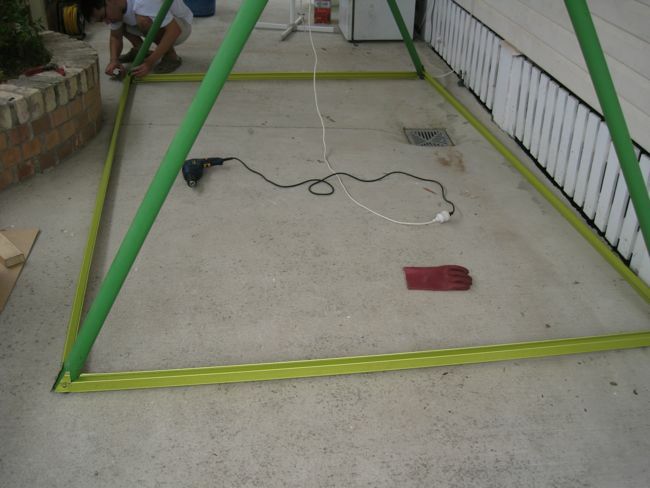 Using the offcut of the sheeting to cover one end of the frame.. it is like a jigsaw puzzle..
We lay 2 sheet overlap on top of the frame (the yellow steel) and bolt it onto the A-Frame at one go.. once all the sheeting in place, it is time to fit the avery mesh.. 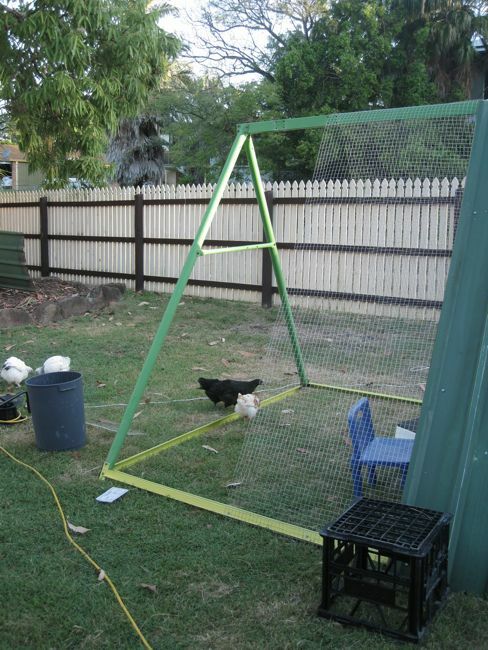 I did not use the chicken wire given to me as I already order some avery mesh on line before I know I am getting some chicken wire.. wish I have used the chicken wire though.. at hind sight.. the chicken wire will be more easy to handle..
By the time we one the first section of the mesh installed it is pass 6:30 in the evening and we also do not have the right tool to join 2 lots of mesh at that point of time so that is end of day one..
Don’t really know how it happen, but I got sunburn from Saturday, Sunday is another hot day so we did not start work until well into the afternoon.. 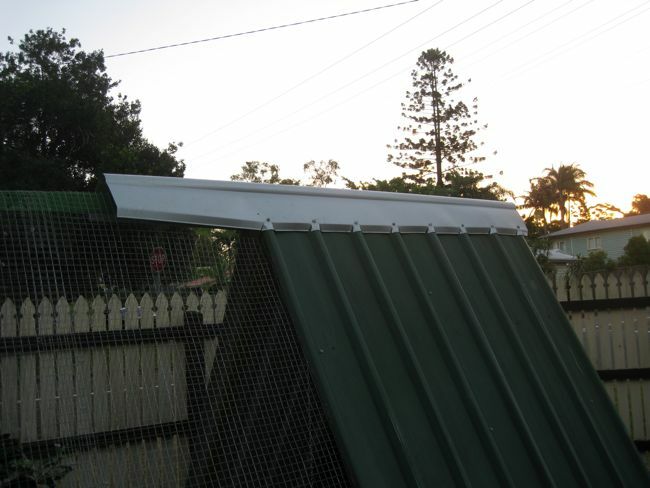 I spend the morning in Bunning checking out supplies..
Come home from work today to see the roof ridge being installed by my neighbor.. now the coop is water proof..
Food and Drink hanging from the roof.. Finish product with happy chooks.. I must admit, I think it will be another ‘all talk and no action’ project if the neighbor have not been actively involve in this project.. apart from fitting the roof ridge as finishing touch he did not involve in any of actual building.. but he contribute heavily on the material.. not to mention the moral support.. knowing that he is just across the road and will be more than happy to help if we stuff up give us the confident to put the thought into action..
LoVe LoVe…going to start on ours in the morn…. Love it. My husband does aluminum, so all of our chicken coops have siding for roofs. Where do you purchase the framing material for the door and the bottom? 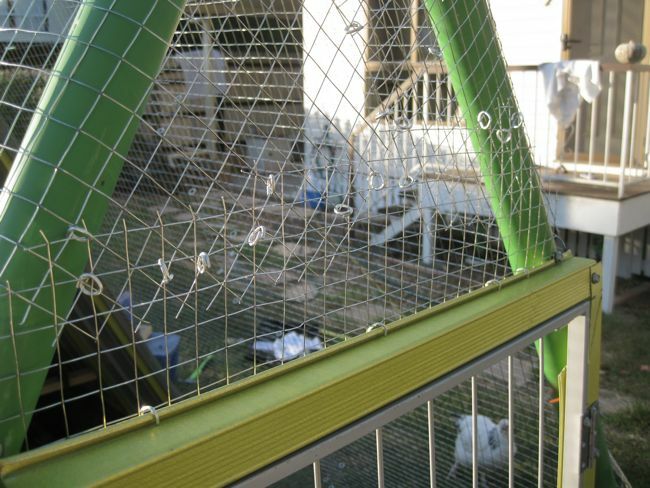 The problem with chicken wire is that sparrows can get thru it wand eat your chicken feed. I think the avian mesh was a good choice. 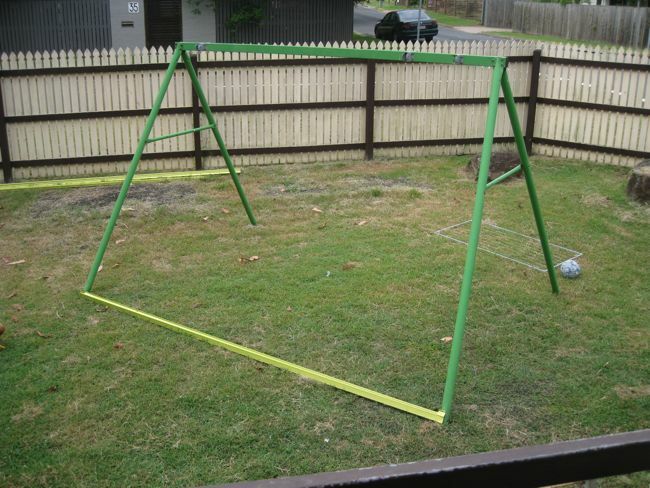 Loved this idea of reuse of the old swingset..very creative. 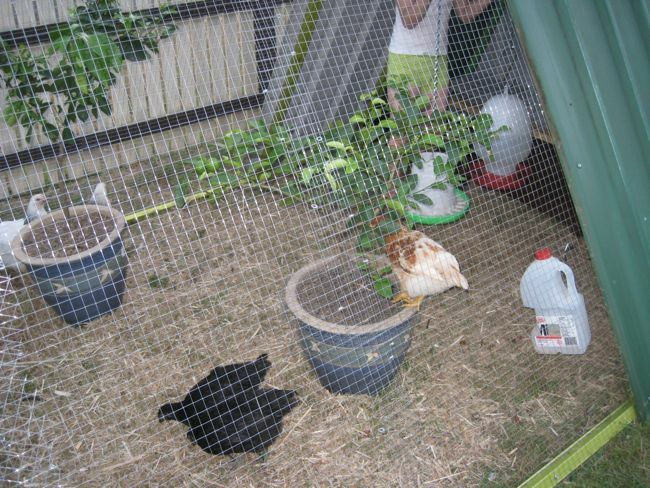 I have chickens too but we used coop ideas provided by Purina. You must be lucky to live in a year-round warm climate as this coop would have to be enclosed at least partly to work here in northern Indiana. Good Luck! Cute one….. very good reuse! Reblogged this on Holistic Days. Good on yer mate! Add a couple of wheels to the nesting box end and a couple of “handles” to t’other and you have a “chicken tractor”. 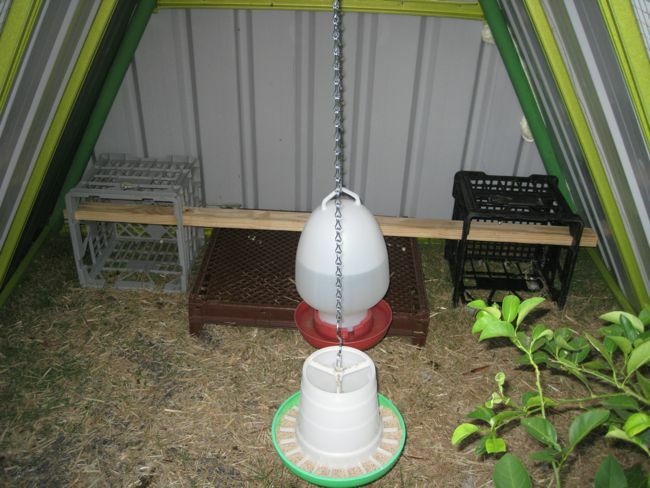 Move it around to new pasture and fertilise that soil. 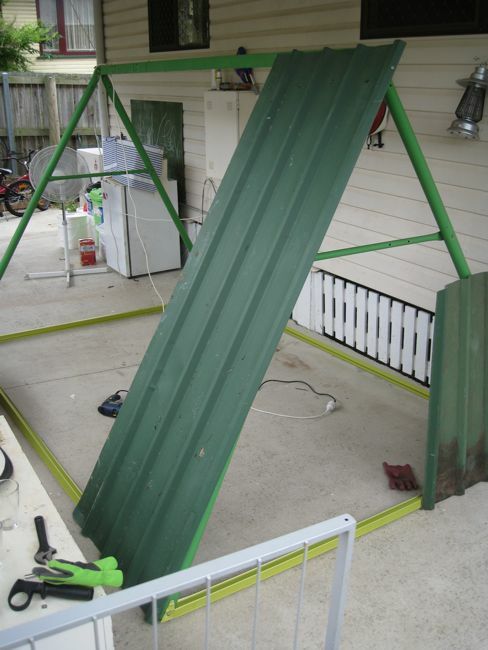 Your local recycle centre will have everything you need to build these. 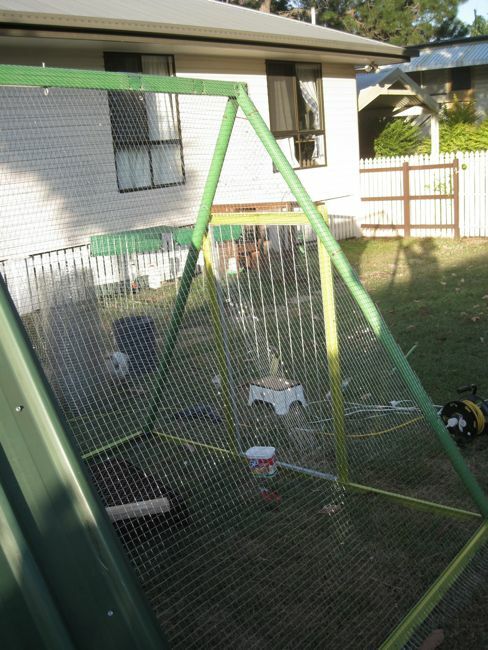 Hello I really am impressed at this i have the same swing set frame, can i please have a list of items i need to buy and measurements.I have wanted to build a chicken coop but i am on a limited amount of funds. 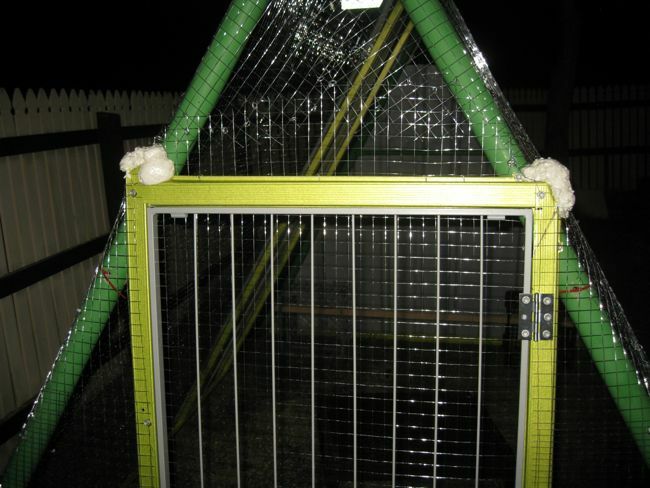 nice idea, but in NH, the chickens would freeze in the winter without being enclosed. 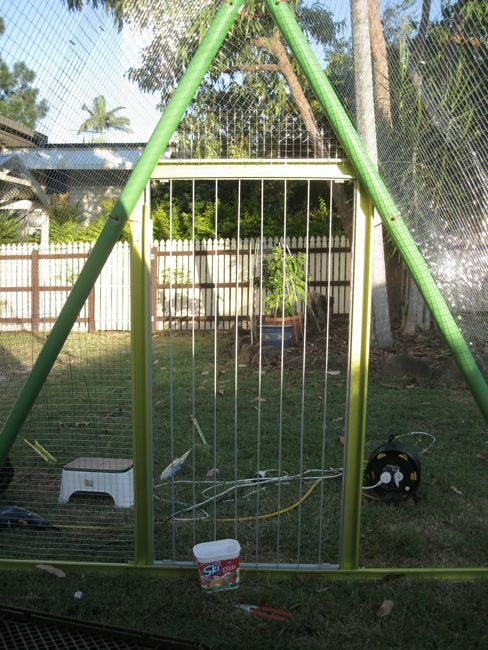 OK. I’ve been sitting on my new swing looking @ my old swing frame in the dog pen wondering what to do with it. Now I know thanks to you. The fact that #1, I’m female, #2, I’m only 5′ and the biggie, #3, I’m 73, the project will be scaled down a bit. However, I’m determined. My results will most likely NOT be posted due to the fact that I’m very sensitive about embarrassing my hens. Thank you so much for your post. Your project took lots of work, time and effort resulting in a VERY handsome home for your ladies. 4 eggs in 3 days?? ?